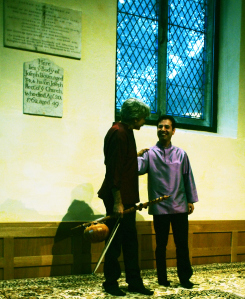 On Thursday 5th June I went to see Kayhan Kahlor in a church in the centre of York; the National Centre for Early Music. Kayhan plays an Iranian instrument called the Kamancheh. It is a Persian violin or Persian spike fiddle played like a small cello. He did a duet with a man named Ali Bahrami Fard who played a bass santur, which is like the in side of a piano and you hit strings with little hammers. The duet was an hour and a half with total improvisation. I sat on the front row. The music was unbelievable it was one of the best concerts I have ever seen. At the end he and Ali bowed and Kayhan smiled at me and they went off.